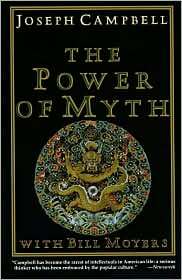 The Power of Myth is a series of conversations between journalist Bill Moyers and mythologist Joseph Campbell that took place in 1985 and 1986. In this remarkable collection, Moyers managed to ask Campbell the right mix of questions to help show Campbell's rich framework of mythology and spirituality. Campbell, who died in 1987 at the age of 83, was a lifelong scholar in both mythology and comparative religion. This book is a transcript of a six-part documentary that aired on PBS in 1988. I listened to the audio version of the documentary before reading this book. Campbell believed that the religions and spiritualities of the world throughout the ages told the great myths of humanity. These myths are stories of human experiences with truth, meaning, and significance. Not to be confused with childhood stories and folktales used for entertainment, the myths Campbell talked about are “clues to the spiritual potentialities of the human life” which teach you that when you turn inward, you begin to get the message of the symbols (5). The symbols Campbell referred to are found in all of the religions in the form of metaphors. When understood metaphorically, religion then becomes more poetry-the language of the mysterious and transcendent-than prose. These experiences are difficult, if not impossible, to convey or explain when using conventional prose. It takes the poetry of metaphor to begin the awakening. However, as Campbell said, the mystical experience is needed to catch the message. Here is a particularly striking exchange between Campbell and Moyers. The mystery has been reduced to a set of concepts and ideas, and emphasizing these concepts and ideas can short-circuit the transcendent, connoted experience. An intense experience of mystery is what one has to regard as the ultimate religious experience. This is utterly fantastic and, reflecting on my own mystical experiences, was how I broke free of the dark spiritual night and transcended to new experiences of the divine. I had to let go of the conventional spiritual notions to which I was clinging.